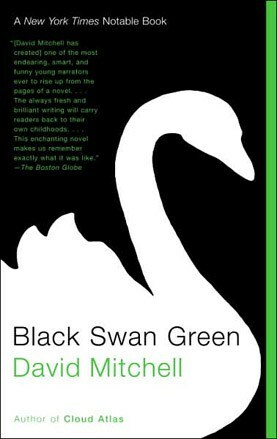 Andy Fenwick and Joel Korte join Peter Reitzes to discuss Black Swan Green by the British writer David Mitchell. Black Swan Green takes place in early 1980s England and is narrated by Jason Taylor, a 13 year old boy who stammers (stutters). One reviewer has referred to Black Swan Green as “Britain’s Catcher in the Rye.” Prominent themes are bullying, being different, divorce and family relationships and underlying all of this is Jason’s stammering. The author, David Mitchell, is a person who stammers (in Britain, stammering means stuttering). Using the voice of Jason Taylor, Mr. Mitchell has created perhaps the finest fictional account of stuttering , or more to the point, of avoiding stuttering. Check out this really great blog post titled the Black Swan Green Soundtrack which discusses the music and songs mentioned in the novel. Andy Fenwick has an MFA in poetry from Sarah Lawrence College, has published poems & fiction-reviews in numerous literary journals, and is a current contributor of author profiles and novel reviews to Benet’s Reader’s Encyclopedia, 5th edition (Harper Collins). Joel Korte is a “B Team” co-host, a person who stutters and attends a masters program for Speech-Language Pathology at the University of Minnesota on a part-time basis. He attained his undergraduate degree in Electrical Engineering at the University of St. Thomas in St. Paul, MN in 2007. He currently works as a design engineer for ZVEX Effects, a highly regarded guitar effects pedal company, and is a musician in a Minneapolis based band, Ghost Towns of the West.